JCB, Rocester/GB/ USA, Sept. 2013: JCB Germany has announced the biggest single investment ever in its business as the company prepares to celebrate 50 years of trading in the German market. The company plans to build a brand new, $40 million headquarters for JCB Germany in Cologne. “Germany is Europe’s biggest single construction equipment market and the fifth largest in the world," said JCB Chairman Lord Bamford. “This is fantastic news for the German market and JCB’s customers," added JCB Germany Managing Director Frank Zander. “This is fantastic news for the German market and JCB’s customers," added JCB Germany Managing Director Frank Zander. "It will enable us to take the sales and service support we offer in Germany to completely new levels and help ensure we grow the business." The new German HQ -- which will cover nearly 550,000 square feet -- will remain in Cologne and will be located at the junction of the A1 and A4 to the west of the city. The location provides excellent access to the center of Cologne and the city’s airport. It will incorporate modern office space as well as training and workshop facilities for JCB Germany’s network of construction and agricultural dealers. 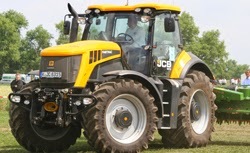 The new facility will also host customer visits and include a showroom displaying new JCB models.